What is the one side dish that comes to mind when you think of the holidays? 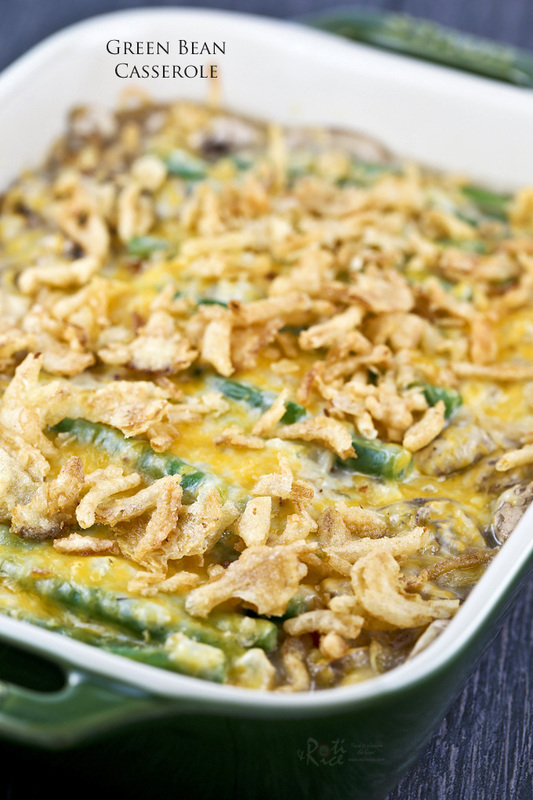 Safe to say for many it is Green Bean Casserole, the quintessential side dish for Thanksgiving in particular. 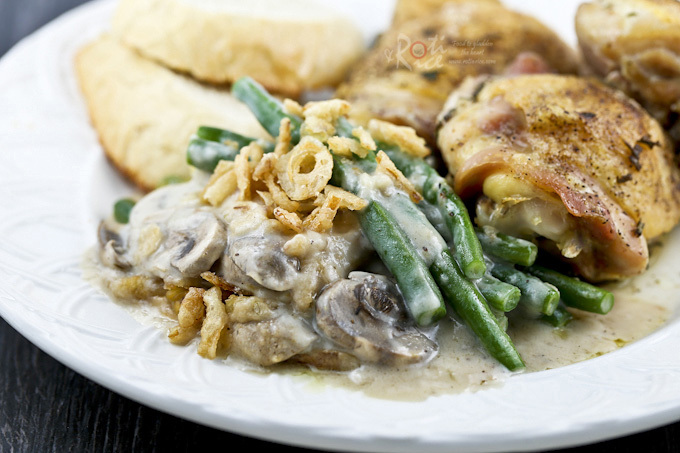 When cooked right, those crunchy green beans combined with a creamy sauce topped with crispy fried onions make this dish almost irresistible. 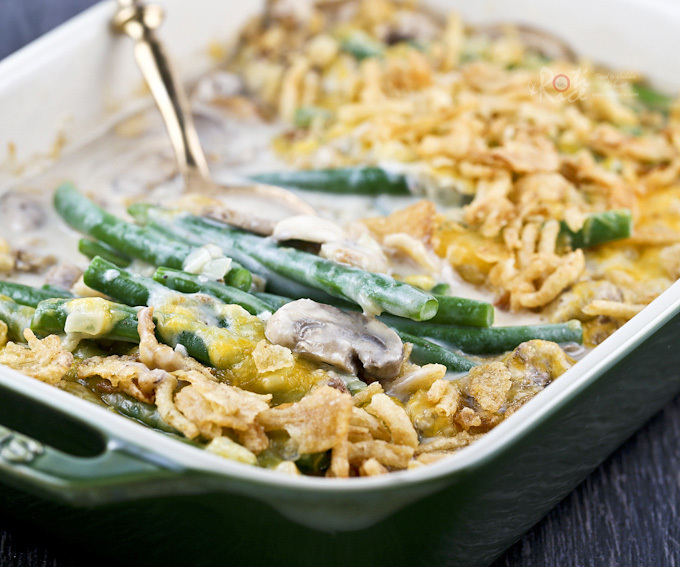 If you enjoy the condensed soup version, I promise you will like this Green Bean Casserole Made from Scratch even better. The beans are left hold so that they retain their color and crunchy texture. Mushrooms are added for greater flavor. The made from scratch white sauce is lighter and fresher. Melted cheese holds the dish together and crispy fried onions gives it that golden inviting look. Cooking the sauce does not take long at all and it is well worth the effort. Once you have tried making your own white sauce, you will not go back and reach for the canned soup. I think you will agree that Green Bean Casserole Made from Scratch is way, way better than the short cut version. Line up green beans on a chopping board a few at a time. Cut off the tops and tails. Bring a large pot of water to boil. Blanch green beans for 3 minutes. Remove with strainer and immediately place green beans in a cold bath to stop the cooking. Drain and transfer to a casserole dish. Mix in sliced mushrooms. Melt butter over low heat in a saucepan. Sauté onion and garlic for 2 minutes until soft. Add flour and stir constantly until mixture starts to brown, about 3 minutes. Stir in dried thyme. 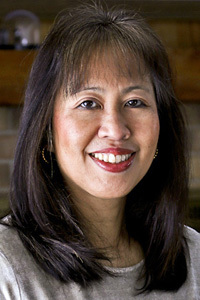 Gradually pour in milk whisking or stirring into a smooth bubbly sauce. Season with salt and pepper. Turn off stove. Pour sauce over green beans and mushrooms. Sprinkle cheese on the top. Bake in a preheated 350°F (180°C) oven for 25 minutes. Remove casserole from oven and sprinkle French onions on the top. Return to the oven and continue to bake for another 5 minutes. I served this delicious side dish with this easy golden crispy skin Rosemary Thyme Baked Chicken. If you are serving this for Thanksgiving, please check out my Roast Turkey with step-by-step brining and rosting instructions or fuss free Dry Rub Roast Turkey. Bon Appetit! Green bean casserole has always been a favorite of mine, and I too prepare mine without any prepared soups. I’ve never tried adding cheese, though! I’ll have to give that a try sometime…after all, adding cheese is never a bad idea!